Hadad Bros. of Israel used the classic shape which we all associate with a Menorah, and executed it with an etched column which gives it height as it soars towards the lights on top. The sterling silver Hanukkia weighs 370 grams. When you think of a Hanukkah Menorah – this is the shape in our mind – four rounded stems coming out of a central trunk. The Hadad Bros. silversmiths took this classic shape and infused it with elegance and beauty, so that yours will be a happy Hanukkah. One Hanukkah candle is lit on the first night of this Jewish holiday, and each night one keeps adding another one, until on the eighth night all eight of the candles are lit. As with other Hadad Bros. menorahs, you can light this one with either oil and wicks or wax candles. It is customary that all eight candles will be lit in one straight row, and this Hanukkah menorah allows you to do so. The candle base in the center is set higher and to the side of the other bases, as it is made as a base for the candle used for lighting all the others, name the " Shamash" – literally "caretaker" or "helper". The base of this menorah is set on four ornately carved legs. The smooth square silver base narrows in several small, dainty steps of smooth silver to reach the main column of the menorah. This column curves sharply upwards while etched in graceful flowing lines which reach a much narrower smaller square in smooth silver again. The square is topped by a circle in smooth silver, which then serves as a base for the continuation of the column, also etched in flowing lines which reach just below the arches holding the candle bases. These lines continue upwards all the way to the Shamash, with round smooth silver rings interspersed between each arch. Each of the arches flows from the central column as a slender stem, topped by a smooth silver jug shape on both sides. This shape is repeated for the Shamash as well. You will be proud to give this gorgeous example of sterling silver Judaica, or get it for yourself and your family. 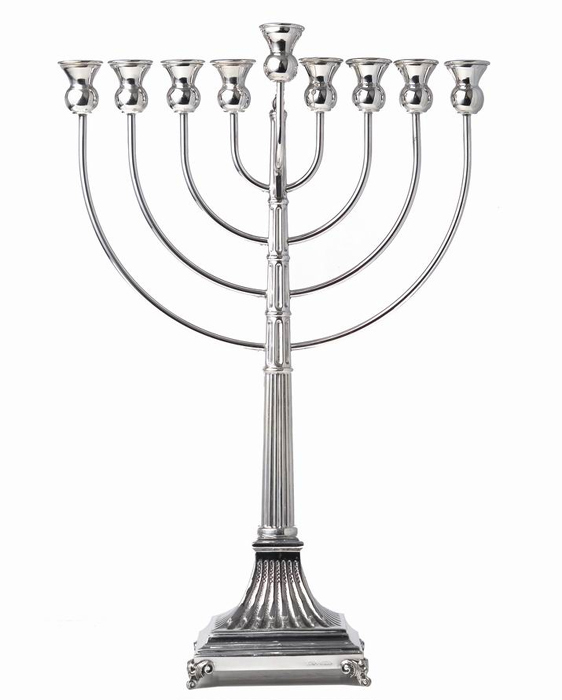 This classically shaped Hanukkah menorah will bring joy this year and for many years to come. This Menorah is 15.5" tall and 10.6" wide (39.5 cm x 27 cm).